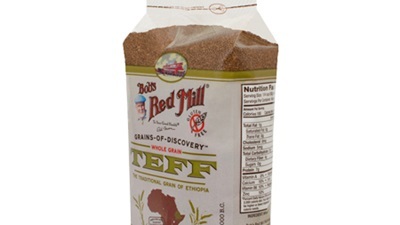 One of the tiniest seed grains, teff, is gluten-free and full of vital nutrients and minerals. An ancient grain from Ethiopia, teff comes in both ivory and dark and has been around for centuries—however, it’s only lately that it has come back into fashion in the North American diet, due to the rise in Celiac disease and gluten intolerance, and the quest for tasty, healthy, gluten-free grains. If you have ever eaten at an Ethiopian restaurant, you may have tried it in a type of bread they call enjera. Teff is a good source of iron, calcium, protein, fiber, and B vitamins. As it is gluten-free, celiacs can rest easy with teff. It’s also a great food source for diabetics as it helps control blood sugar levels. When cooking teff, add half a cup of teff grain to two cups of water with a pinch of salt. Bring to a boil and simmer in a covered pot for 15 to 20 minutes or until water is absorbed. Stir and let stand uncovered for five minutes. I sometimes cook teff as a breakfast cereal. I love its nutty taste, which also makes it great for baking cookies, muffins or pancakes. Due to its dark color, I have often fooled my nephews that they are eating chocolate pancakes! Check out my famous yummy teff pancake recipe here.